It’s been almost two years since the announcement of this horror anthology project, and audiences are finally getting a taste of what’s to come from Nightmare Cinema! Starring Mickey Rourke as the owner of the titular theater, you can check out the first trailer in the player below! The film features a slate of talented directors for the horror genre that is made up of Alejandro Brugués (Juan of the Dead), Ryûhei Kitamura (The Midnight Meat Train), David Slade (30 Days of Night), Joe Dante (Gremlins) and Mick Garris (Stephen King’s The Stand). It also features a large cast of heavyweights including Oscar-nominee Rourke, three time Golden Globe-winner Richard Chamberlain (Twin Peaks), Patrick Wilson (The Conjuring 2, Aquaman), Elizabeth Reaser (The Haunting of Hill House) and Adam Godley (Lodge 49). Garris is also producing via his Nice Guy Productions. Courtney Solomon and Mark Canton from Cinelou and 2016 Blood List Alumni Joe Russo round out the rest of the producing team. Good Deed Entertainment’s Scott Donley and Lenny Shapiro, as well as The Fyzz Facility’s Wayne Marc Godfrey and Robert Jones will serve as Executive Producers, along with Cinelou Films’ Scott Karol. 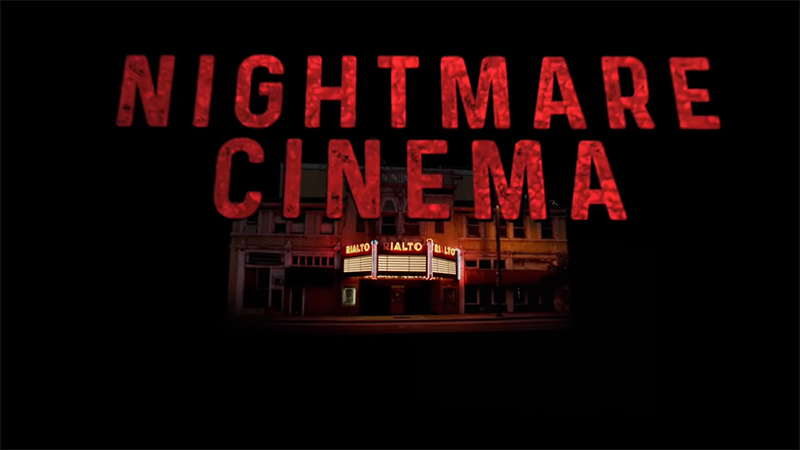 Nightmare Cinema held its debut at the Fantasia International Film Festival in July 2018 and has earned highly positive reviews from critics, maintaining an 88% approval rating from critics on review aggregate Rotten Tomatoes based on 16 reviews. It is set for a limited theatrical and video-on-demand release on February 14. The post Mickey Rourke is The Projectionist in Nightmare Cinema Trailer appeared first on ComingSoon.net.